We left a farm north of Cedar Rapids last night about 7. The skies were gray, sprinkling rain. But we spotted cloud to ground lightning off to the west. 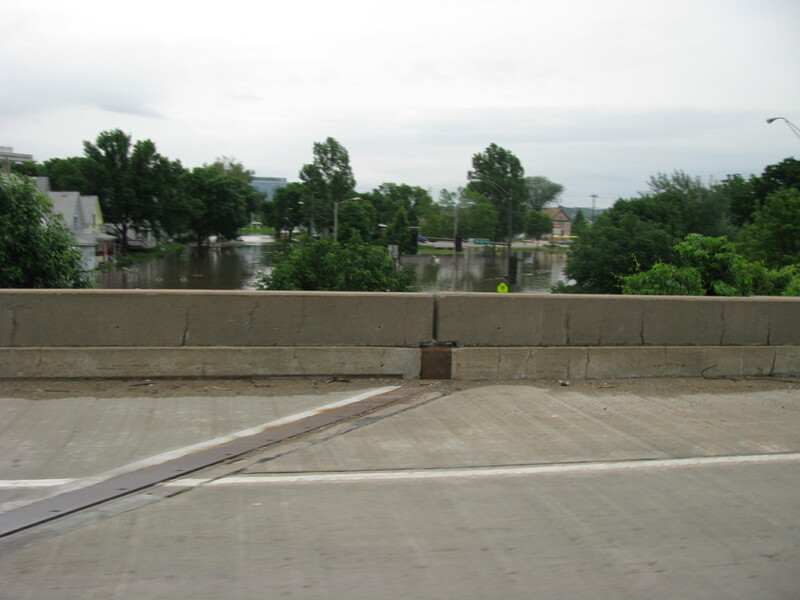 So we thought we ought to book it back east, but the Iowa DOT closed a portion of interstate 80 at 8 pm. Seems like the Cedar River decided to take out the interstate bridge. We drove the Impala to Tipton and then down to exchange 267. We could only go east. Nightfall was coming. The sky was already dark gray. 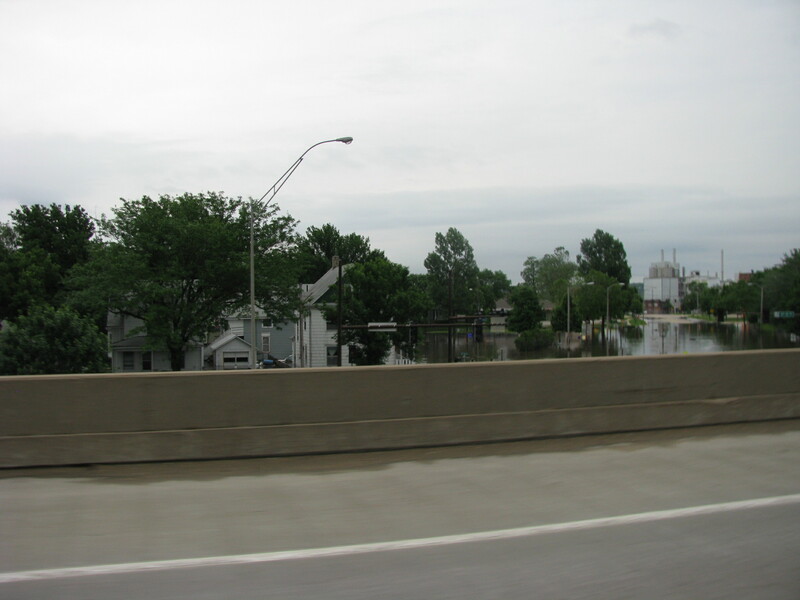 We did notice that I-80 which is normally very heavily traveled, was almost empty. We discovered that IDOT was only allowing local traffic. Not a semi truck in sight. We could see the dark clouds and cloud to ground lightning of what appeared to a nasty storm in our rear view mirror back towards Iowa City. We received phone calls from home in Leclaire that tornados had touched down across the river, and not to hurry home. We later learned that our son was at the neighbors and they all huddled in an interior bathroom and put a mattress over their heads. As we were driving, Kim said she spotted a funnel cloud off to the north. We thought “who is computer proficient?” and ended up calling her sister Heidi in Austin. We asked for Iowa remote weather alert. She checked the computer and said we were right in the middle of several nasty cells, and yes, Kim could very well have spotted a tornado. What do to do, get off the interstate, we were right near a very large truck stop. Kim said, no I have to beat that storm home behind us, and I think the funnel cloud is going north. So we beat it down a nearly empty interstate. We got home, got the dogs out of their crates (they were very quiet all the way home.) We were back in Leclaire about 20 minutes when the storm hit. Four inches of rain and high winds. We went to our bathroom, and it did calm down. But we had lakes in the front and side yards. We had all sorts of river debris and large logs we had to clean out from the dock today. Now we are worrying about a possible flood, cresting on Monday. It is now up higher than it was in April. The flood prediction is now up at 15 feet, cresting on Monday. We have a friend who is a contractor. She came out and did some level work. Fifteen feet would come to the bottom of our porch. We plan on taking the RV north to Minnesota, I wonder how I will route us? 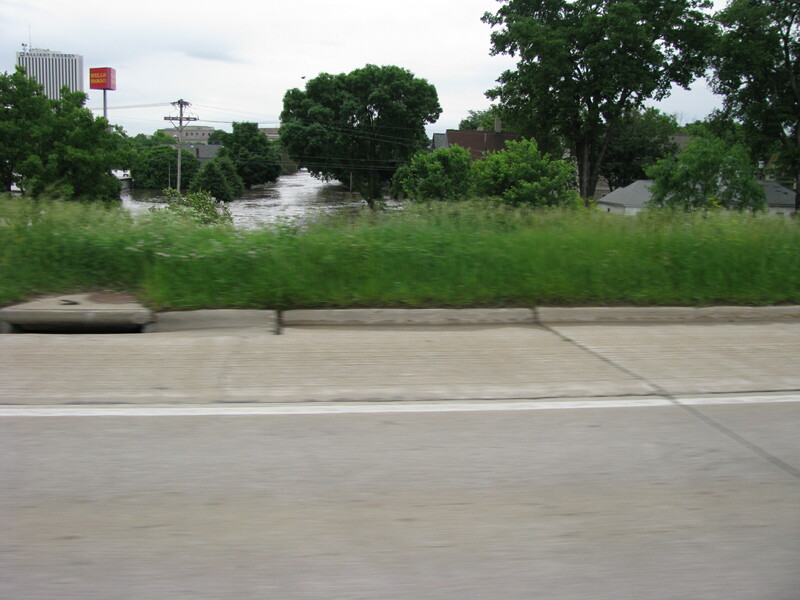 So many Iowa roads, including major interstates are shut down because of flooding. But I get ahead of myself. I don’t think we have the energy or time to get all the furniture out again. Check in tomorrow to see what we decide to do. Okay, we are nuts. We wanted to see the new Cardigan Welsh Corgis puppies just north of Cedar Rapids. So we set out, and decided to snake northeast and try to avoid I-80. 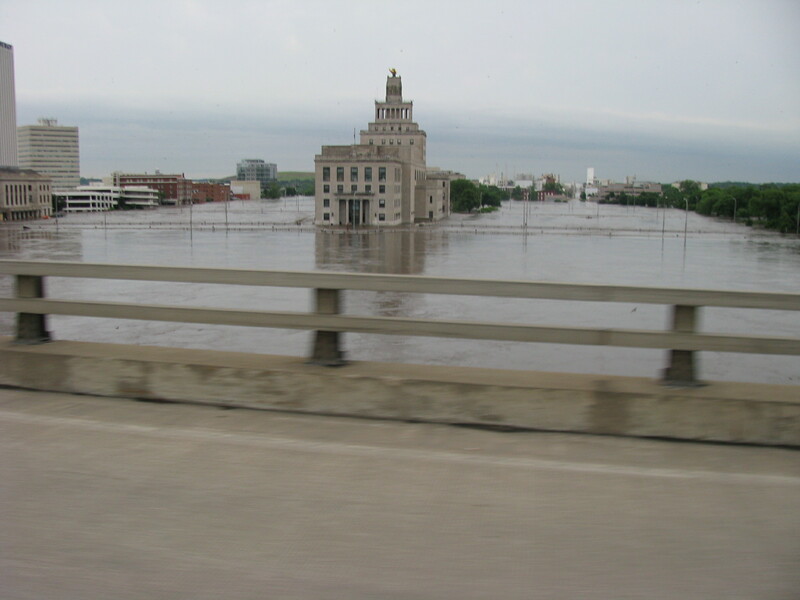 So we went towards Cedar Rapids on US 30. Of course, once we got near the Cedar River, the police just started to close the road behind us. 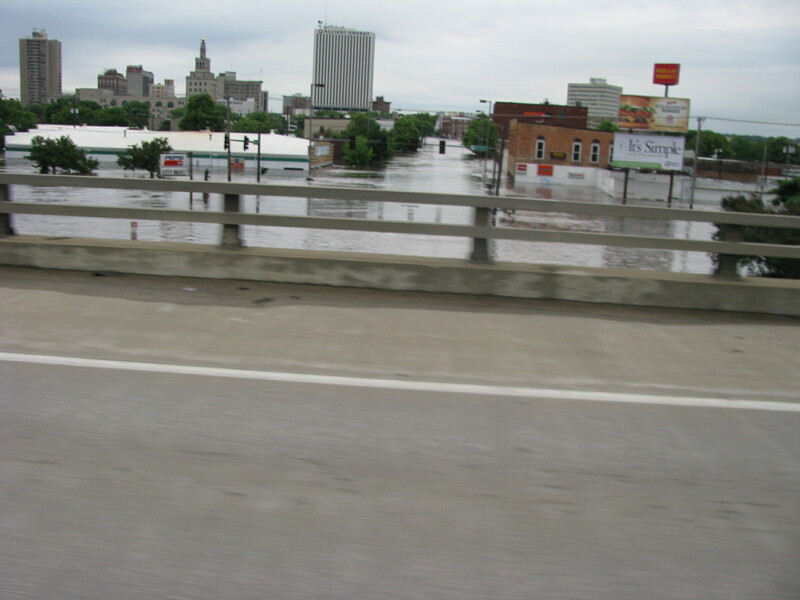 We ended up going up I-380 and went over the interstate bridge which is the only bridge open over the Cedar River in Cedar Rapids. So traffic slowed down. I held the camera out the window and up. The water was incredible. The Cedar is normally a tame river. It had spread out over a mile south of down town. And they are five days from crest. So here are some of the pictures I got. 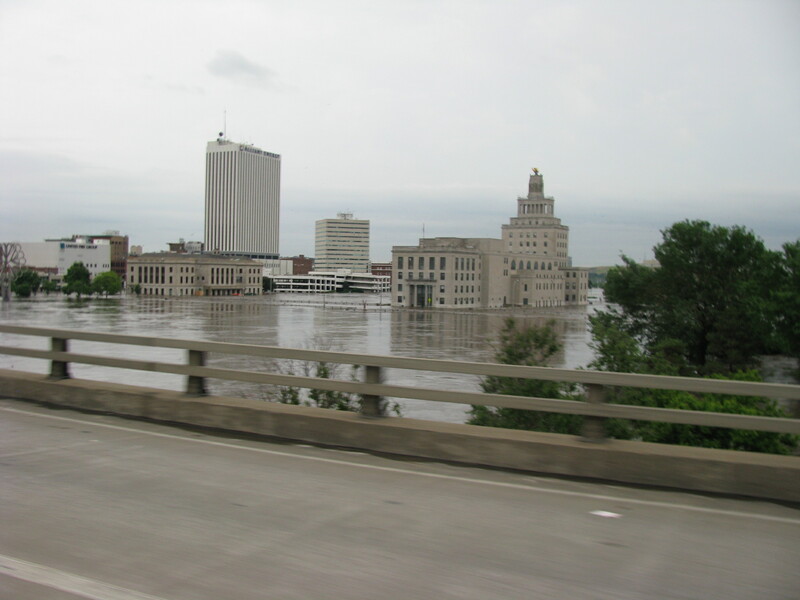 The local news just announced that the Mississippi River is closing to commercial traffic because of the second round of flooding. The tributaries that flow into the river south of here are just flooding awful. 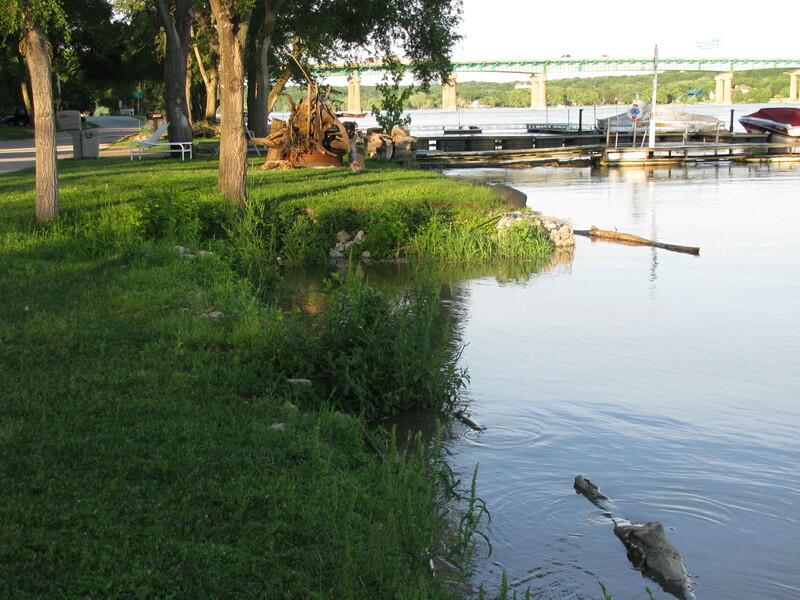 Check out the Cedar River in Cedar Rapids and up river in Waterloo and Cedar Falls.